Produced from trees of the N39, KP423 varieties of Arabica, this is a wet-processed or “washed” coffee, meaning the fruit skin and pulp were removed from the beans immediately after harvesting and before drying. Flight Coffee is a coffee-loving, quality-focused roasting company based in Bedford, New Hampshire. Visit www.flightcoffeeco.com or call 603-836-6228 for more information. 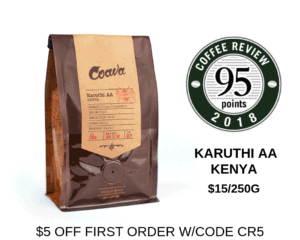 The Bottom Line: A high-toned yet deeply savory Tanzania cup with resonant stone fruit and spicy floral notes throughout.